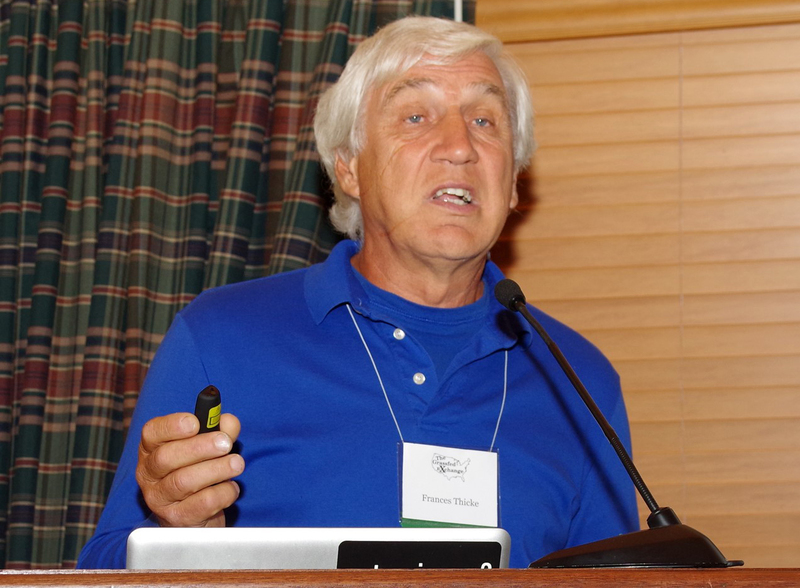 Francis Thicke, an organic farmer for over 30 years and who served on the National Organic Standards Board, led a talk titled From Grass to the Grocery Store Shelf. Corn is the dietary staple of most cattle because it’s an inexpensive feed that fattens the animals quickly – but that comes at the expense of the cow’s own health. Grassfed cows are healthier and the meat and milk that comes from them is better for humans. And the cycle of grass-based grazing is better for the land, water, and air. 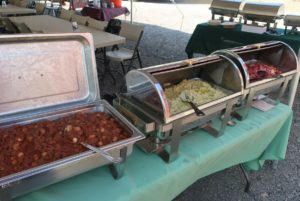 Fortunately, grassfed meat is becoming a serious market force, a message that underscored this year’s annual conference for members of the Grassfed Exchange, a volunteer organization that has spent nearly a decade collecting and disseminating information to anyone involved or interested in the product. 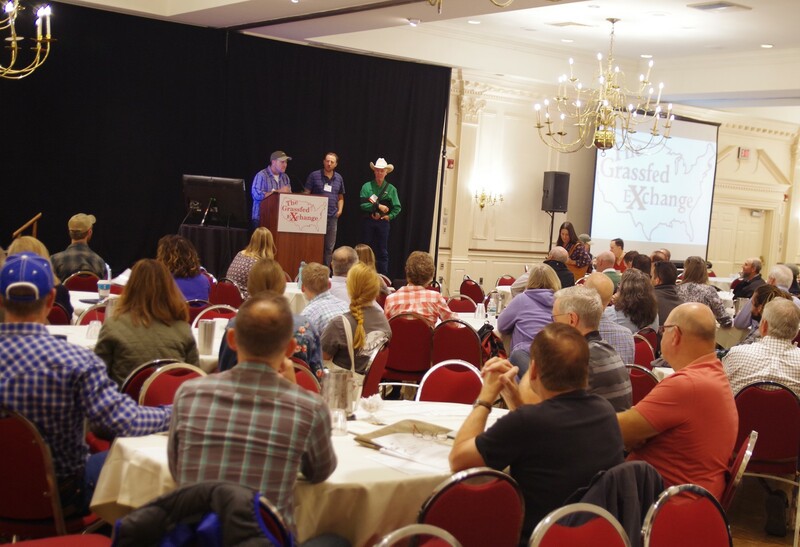 The sold-out conference, which took place September 27-29 at the Desmond Hotel in a suburb of Albany in upstate New York, brought together 500 attendees (100 more than last year’s conference) from 40 states as well as from Canada, Holland, Australia, Algiers, Auli (in the Chamoli district in India’s Himalayan mountains), Great Britain, and Norway. Previous conferences have taken place in Nebraska, North Dakota, Missouri, Michigan, and Georgia; this year, New York’s extensive amount of grassfed dairies and grassfed cattle was recognized. 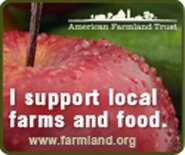 The conference kicked off with tours of two such farms: Dharma Lea, in Sharon Springs (Schoharie County, NY), and Black Queen Angus Farm in Berlin (Rensselaer County, NY). Both are family-run businesses that take a holistic approach to grassfed cattle management, and Dharma Lea demonstrated the gustatory effectiveness of such a practice by offering a lunch prepared from their own beef, with some help from a neighboring farm, along with locally sourced organic potatoes, eggs, dairy products, and root vegetables. Boots and dungarees were the norm for the farm tours, and the dress code didn’t change once the folks got back to the hotel. 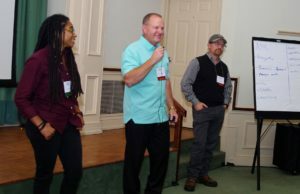 The ensuing two days of talks and trade show featured an impressive array of speakers addressing topics ranging from land cultivation to butchering to marketing. From Grass to the Grocery Store Shelf was the theme of a talk by Francis Thicke, who owns and runs the 90-cow Radiance Dairy in Iowa (with the highest five cow rating from the Cornucopia Institute), and has been an organic farmer for over 30 years. He and his wife, Susan, take their product from barn to bottling and on into the select stores and restaurants that buy as much as he can produce. He described himself as a “recovering bureaucrat,” noting that he worked as a National Program Leader for Soil Science at the USDA-Extension Service. He also has served as a member of the National Organic Standards Board. Away from bureaucratic demands, Thicke radiates a pleasant, laid-back nature. “We start by going all the way back to the soil,” he began, which isn’t surprising – he has a Ph.D. in Agronomy/Soil Fertility from the University of Illinois. “We’re talking about geologic material that has been affected by plant matter,” he said, and what followed was an elegant tour through ecological cycles that too often suffer from the monoculture of industrial agriculture. Other talks covered such topics as Regenerative Agriculture and Why Bugs Matter, Kale vs. Cow, The Keys to Ecosystem Health, The Multi-Species Advantage, and a talk titled Water Is a Verb by noted ecology writer Judith D. Schwartz (author of Cows Save The Planet and Water in Plain Sight). At the talk Honoring Meat, Jeremy Stanton, who trained at the Culinary Institute of America at Hyde Park (Dutchess County, NY) and has helmed kitchens in New York, Florida, and the Berkshires, where he lives, noted that “The art of butchering is the art of marketing,” Stanton has butchered and sold meat in his own retail setting, and currently operates Fire-Roasted Catering in Great Barrington (Berkshire County, MA), creating events that feature an open wood fire for the cooking. “It’s about making the display case look beautiful.” Key to that is learning how to communicate with the slaughterhouse you work with. The talk, The Ins and Outs of Grass-Fed Beef featured three speakers with deep insight. Jasmine Dillon, a PhD candidate in the Department of Animal Science at Penn State University, has combined interests in grazing systems and food security into her dissertation research on multiple sustainability indicators for grassfed beef production systems across the country. She emphasized the need to examine the environmental footprint. For a beef operation, this includes resource inputs (fuel, fertilizer, machinery, the animals themselves) that go to animal and food production as well as manure handling, with resulting air, soil, and water emissions. And there are measurable components to that footprint that include carbon, reactive nitrogen, fossil energy, and water. And the third speaker, Dr. Allen Williams is a founding partner of Grass Fed Beef, LLC, and Grass Fed Insights, LLC, and is also a partner in Joyce Farms, Inc. (a family farm in Winston-Salem, NC, with partner farms located in the Carolinas, Georgia and Virginia, which process and market beef, poultry and game). Williams pioneered many of the early grassfed protocols and forage-finishing techniques, and describes himself as “recovering academic,” thanks to fifteen years on the faculty at Louisiana Tech University and Mississippi State University. He offered advice for transitioning from conventional to grassfed. “You have to start with soil health, increasing the microbial population. Then you need complexity and diversity in your pastures. The monoculture farming we’re used to makes it more difficult. Then there’s genetics. You have to look at the proper phenotype and bloodlines. Also, you should understand how being a finisher affects your bottom line. Know what finished cattle looks like – and have a market! 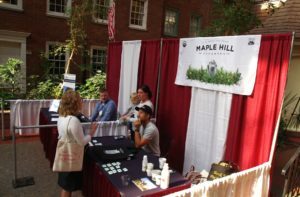 The talk Grass Fed Dairy Excellence was led by Maple Hill Creamery’s Tim Joseph, who sources milk from over a hundred small family farms, at the center of which is the 250-acre dairy farm that Tim and Laura Joseph bought when they expanded their own farming operation in 2003. “I wanted to stop working in the corporate world,” said Tim, and because they realized that a crop income comes only once a year, they “got some cows” at the very start of their farming life. 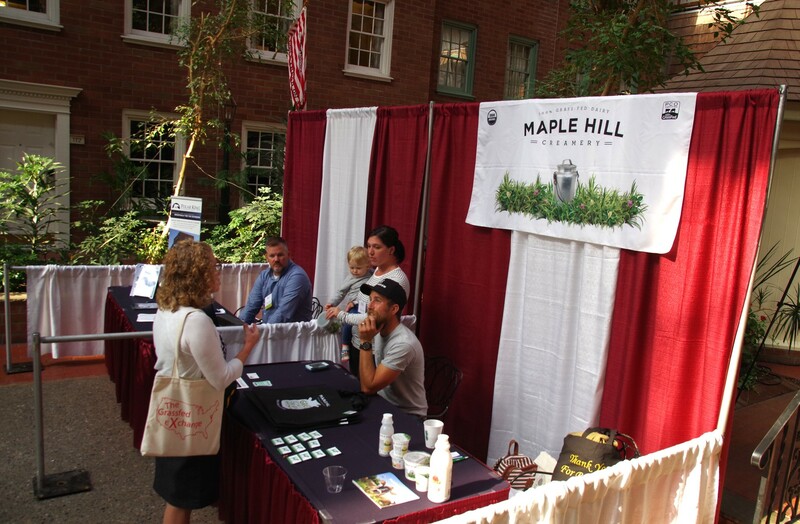 Joseph’s talk was given in conjunction with Phyllis Van Amburgh, co-owner of Dharma Lea, the first of the farms to sign up with Maple Hill Creamery as a milk supplier. For the Josephs, becoming dairy farmers became a trial-and-error process, but eventually they not only learned how to cultivate cattle but also took their herd to grassfed, certified organic status in 2007. “At which point we were more broke than when we started.” Tim sought an alternative to milk sales, and hit on the idea of producing yogurt. Maple Hill Creamery’s success now sustains not only the Josephs’ own 250-acre dairy farm but also the small family farms (over a hundred) who provide the creamery with milk from grassfed cows.